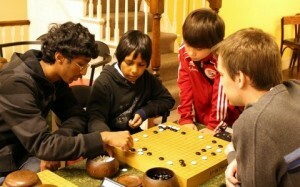 Dahzi Xu 5D won The NY Go Center’s “Falling Leaves” tournament last Saturday, October 23, directed by Boris Bernadsky. Runners-up were David Shainok 1D and Mohammed Saqif Noor, a 10-year-old 10K with pro aspirations. During a break between rounds, Bernadsky introduced “Stephanie” Ming-Ming Yin (l), a Chinese 1P who is also an Adelphi University freshman business major. 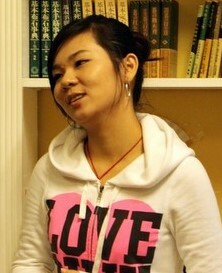 Yin, who studied go with Nie -Wei-Ping, is the New York Go Center’s new “club pro,” and says she intends to stay in the New York area at least until finishing her studies and will devote some of her time to teaching at the Center. For her first event, she will play up to ten simultaneous games there on Saturday, November 13. Write to manager@nygocenter.org to register. Another highlight of the event was a go book sale during the lunch break. About twenty titles were available from a book stand operated by Kinokuniya, a Japanese bookstore featuring the largest selection of English-language go books in North America. No go player should pass through New York without paying a visit; but first, stop by the Go Center and get a special 10% discount coupon. Kinokuniya plans to continue selling books at future NY Go center events.